Both Dal Makhani and the saffron rice are exotic recipes but believe me I prepared this during the weekdays. Thanks to my kitchen appliances which helps me to whip up these recipes quickly. 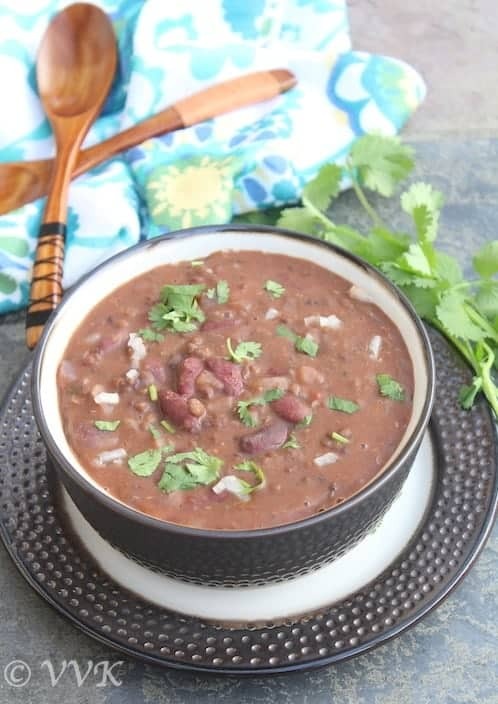 As Dal Makhani involves soaking time, you need to plan and soak the dal ahead. Once you have the soaked dal, rest all can be assembled pretty easily. 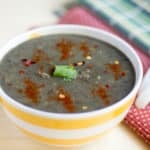 Few of my friends were asking for day-to-day vegan recipes. In that quest, I took non-vegan recipes and started trying out the vegan version of the same. 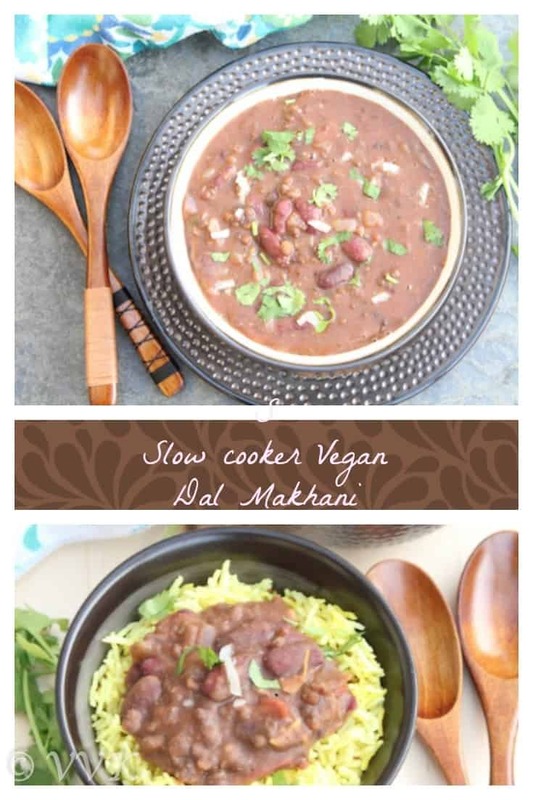 One such attempt is this Vegan Dal Makhani. I started to try and experiment all the North Indian sides only after coming to the US. I used to get store-bought masala powders for all the gravies and for dal Makhani I did the same. Of course, I saw the ingredients in the masala and later started to try my own masala mix and I am going to share the same today. Its the mix of garam masala (I usually add garam masala along with the dal), red chilly powder, coriander powder and amchur powder. One interesting ingredient in this masala mix is the Mace or Jaathipathiri and also nutmeg. I have explained about these two the Dindigul Biryani recipe. You need a very small amount of these two but believe me, these two add that unique flavor to the recipe. 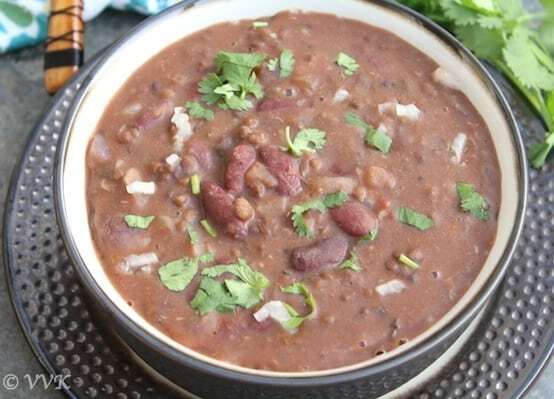 Also for Dal Makhani, I used three Dals in equal proportion, One-third cup of channa dal and one-third cup of black urad dal and one-third cup of red kidney beans. 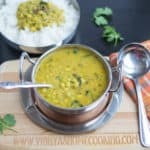 Channa dal can be skipped but as we like the flavor of it so I always opt for that. Before getting into the recipe, let me share how I planned and executed this recipe. I soak the dals overnight. Evening by the time I get back from work, the dal will be all cooked. While preparing the masala mix for the dal, I did the prep work for my saffron and turmeric rice and set it in the rice cooker. Soak the dals overnight or for at least 6 to 7 hours. Chop the tomatoes, onions, and cilantro and set aside. Add the dal to the crockpot and add 4 cups of water, 3/4 tsp of salt, 1/2 tsp of garam masala and 1/4 tsp of turmeric powder. Mix well. 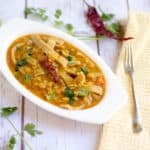 Cook the dal in Slow Cooker under high setting mode for 7 hours. After 7 hours, mash the dal well and set aside. Once the oil is hot, add the cumin seeds and hing. As they start to splutter, add the chopped onions and cook until the onion turns translucent. Now add the tomatoes and salt. Mix well and cover and cook until the tomatoes turn soft. At this stage add all the dry masalas(Red chilly powder, coriander powder, amchur powder, cardamom powder) including mace and nutmeg and mix well. Now add the cooked dal and add the sugar. Check for salt and adjust according. Let it simmer in low heat for unto 15 minutes. Finally, garnish with cilantro and serve hot with rice. You can cook the dal in the pressure cooker too. Use the same amount of water and pressure cook for about 4 to 5 whistles and when preparing the gravy let it simmer for more than 15 minutes. For the non-vegan version, you can replace the oil with butter and once the gravy is done instead of sugar you can add fresh cream to add the richness. Almond milk or cashew milk can be added too, but I didn’t use them. I used sugar and cardamom powder to get the hint of sweetness. Adjust the salt and spices as per your preference. One or two green chilies can be added too while sautéing onions. I didn’t use ginger-garlic paste. About 1/2 tsp can be added. 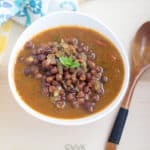 Channa dal is optional if you are skipping add 3/4 of rajma beans and 1/4 cup of black dal or in your desired proportion. 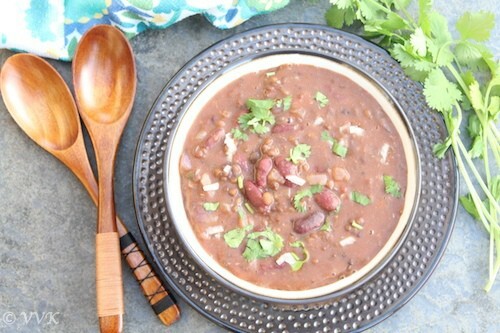 Safety Warning: As Rajma releases toxins when slow cooked, please make sure you soak them for at least 6 to 7 hours. 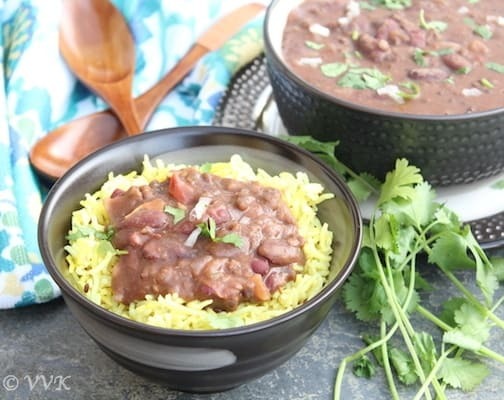 The slow cooker, vegan version of the popular, protein rich Punjabi Dal Makhani which is prepared with Red kidney beans, channa dal and black urad dal. Chop the tomatoes, onions and cilantro and set aside. Add the dal in the crockpot and add 4 cups of water, 3/4 tsp of salt, 1/2 tsp of garam masala and 1/4 tsp of turmeric powder. Mix well. 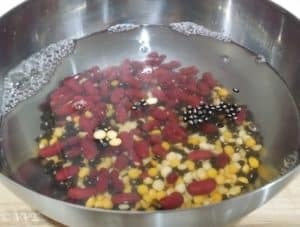 Mix well and cover and cook until the tomatoes turns soft. At this stage add all the dry masala (Red chilly powder, coriander powder, amchur powder, cardamom powder) including mace and nutmeg and mix well. Finally garnish with cilantro and serve hot with rice. 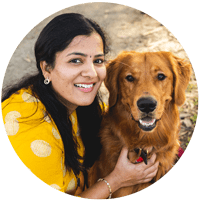 Beautiful clicks and great recipe Sri! very healthy & yummy curry. 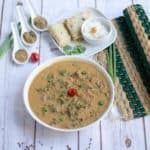 Such a healthy and delicious looking dal makhani. 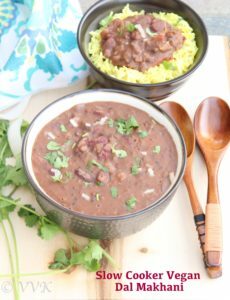 Love how you made it vegan in slow cooker. Lovely share, Srividhya. Have a lovely weekend. Thanks a lot Anu. :-) Glad you liked it.